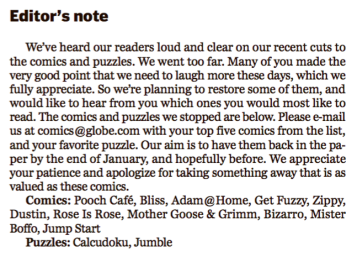 The Great Comic Strip Follies at the Boston Globe continued yesterday. As the hardreading staff previously noted, right before Christmas the cheapskately local broadsheet announced that it had “discontinued several strips and two puzzles” from its daily editions. By “several strips,” of course, they meant 11. Two weeks later, the Globe moonwalked from its comic strip mining. And yesterday the results were in, as we learned from this editor’s note. Seriously? Rose Is Rose instead of Get Fuzzy? Adam @ Home instead of Zippy? We’re sorry to say this, but Globe readers are idiots. 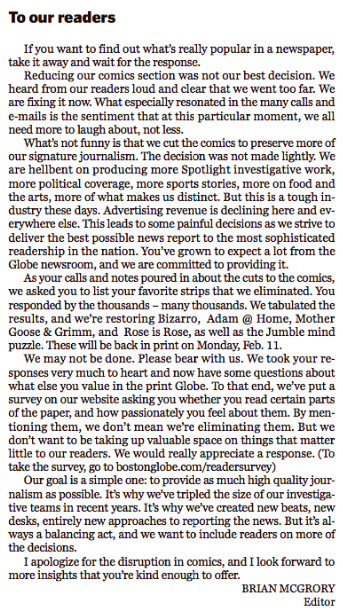 Regardless, the Great Globe Comic Strip Tease is now officially over. Badly done, Globeniks. Very badly done. This entry was posted on Wednesday, February 6th, 2019 at 10:37 am and is filed under Uncategorized. You can follow any responses to this entry through the RSS 2.0 feed. You can leave a response, or trackback from your own site. Adam @ Home is so dull. Its original creator Brian Basset was hilarious with a great art style, but he moved on to his new strip Red & Rover. The current artist on Adam just made it a generic family strip drawn without any of Basset’s character. I don’t get why people would want this stale hamburger; did they forget they started out with steak?